One of the many sad things about the current poor state of Russian-Western relations is the crazy hyperbole being used by commentators on both sides of the divide, accusing each other of the most ridiculous actions and intentions. The degree of exaggeration has of late reached occasionally frightening proportions. On the Western side, a couple of recent examples are an interview conducted by Ben Judah with former Polish foreign minister Radek Sikorsky and an article by billionaire George Soros in The New York Review of Books entitled ‘Wake Up, Europe’. This is nonsense. The European Union is not at war, and European dominoes are not about to fall if the Ukrainian government does not prevail in its struggle in Donbass. Glazyev is not alone in propagating views of the latter sort. There is a common perception among Russians that the chaos created by Western interventions in countries such as Iraq, Libya, and Ukraine is not an unfortunate by-product of mistaken policies, but a deliberate objective. This is also a wholly incorrect view of the world. Stupid we may be, but Machiavellian in that respect we are not, especially as it is hard to see what real benefit we in the West would gain from creating disorder around the globe. Were all of the crazy talk restricted to the fringes of public discourse, it would not matter. Unfortunately, important people with money and influence are perpetrating it, and proposing policies which if implemented would have highly negative consequences. It is time for everybody to calm down a little. Russia is not pursuing a new imperialism. Europe’s existence is not under threat. The West is not seeking the destruction of the Russian Federation. And less hyperbole would be better. In this second post on crackpot theories, I will look at the ‘Responsibility to Protect (R2P)’. Strictly speaking this is a policy rather than a theory, but there is a crackpot idea behind it – the idea that you can make the world safe for human rights by bombing people. The essence of R2P is the concept that if states fail to look after their own people (e.g. by abusing their citizens’ human rights) then other states have a responsibility to protect those people, forcibly if necessary. R2P’s supporters claim that it is about much more than military intervention and that the policy stresses that force should be a last resort. This, in my view, is disingenuous. Take away the military part of R2P and all that is left is some high sounding humanitarianism allied to vague suggestions that we ought to provide aid to those in trouble. Furthermore, the very reason R2P came into existence was to provide philosophical and legal justification for the bombing of Kosovo in 1999 and for future such operations. Military interventionism is at the very core of R2P. I mention this by way of responding to a post by Mark Kersten on the Justice in Conflict blog in which he commented on the recent shooting in Ottawa. Kersten remarks that the Canadian government in recent years, ‘has actively pursued a political philosophy of retribution and control that tarnishes the country’s image as an “honest international broker.”’ ‘Harper’s record attests to an unyielding mission to reshape Canada’s international identity as a tough and hard-power state,’ Kersten says, and this has ‘made it harder to protect civilians in Canada’. The Canadian government’s policies ‘stoke political violence – in Canada and abroad’. I agree, and congratulate Kersten for having the courage to say it. But I have to part company with him when he contrasts the militaristic policies of the Harper government with the R2P-oriented position adopted by that government’s Liberal predecessor. It is precisely R2P which has made the current passion for military adventures overseas possible. In the 1990s, the military-industrial complex in the West had a problem: its enemy (the Soviet Union) had disappeared. It needed a new justification, and found one in the cause of humanitarian intervention. The armed forces would become, as they officially did in the defence policy statements of the United Kingdom, ‘a force for good’, bringing the benefits of liberal democracy to those suffering from human rights abuses around the world. The effect was to lower the barriers to war. This contributed in no small way to the invasion of Iraq and other wars since. In the case of Iraq, arguments that invading would liberate the Iraqis from a vile dictator played an important role in convincing the public in the USA and UK to support the invasion, and in the case of the UK this argument was crucial in persuading many Members of Parliament to overcome their doubts and to vote in favour of military action. What we saw with Iraq was an odd alliance between traditional right-wing hawks and the new liberal-interventionist left. This alliance held firm through the wars in Afghanistan and Libya and on to those in Iraq and Syria today. It is no coincidence that R2P-ers such as Samantha Power were among the most zealous supporters of bombing Libya and of arming the rebels in Syria. The policies which Kersten so abhors rest upon the rock of liberal-interventionism. Perhaps no idea has done more to legitimize the use of military power in recent years than the Responsibility to Protect. In Iraq, Libya, and elsewhere it has left chaos in its wake. This was entirely predictable. For R2P is premised on a false idea – that war can prevent human rights abuses. The truth is that nothing does more to promote such abuses than war. This is why, in my opinion, R2P is a crackpot theory, and also a positively dangerous one. What should we make of Vladimir Putin’s speech to the Valdai Club last week? Headlines have tended to focus on Putin’s tough statements about the United States, and certainly there were a lot of those. Since the end of the Cold War, Putin said, the United States have circumvented the international system in pursuit of American interests. In the process, ‘they have committed many follies. … International law has been forced to retreat over and over by the onslaught of legal nihilism. Objectivity and justice have been sacrificed on the altar of political expediency,’ Putin argued. America has toppled regimes, spread propaganda, and supported terrorists, he claimed, adding that ‘Essentially, the unipolar world is simply a means of justifying dictatorship over people and countries’. The result has been chaos. ‘Sometimes’, said Putin, ‘we get the impression that our colleagues and friends are constantly fighting the consequences of their own policies’. These are harsh words indeed. I note that Putin reserved his harshest criticism for the United States, and generally spared the European Union, except in the case of Ukraine. There can be no doubt that the speech reflects the current tension between Russia and the West. It is also rather one-sided. Just as the West blames Russia, and particularly Putin himself, for the decline in Russia-West relations, Putin places the blame entirely on the West. It would be rather better if both sides would recognize that they have each contributed something to it, and spend more time putting their own actions in order rather than criticizing one another. That said, I think that there are some grounds for thinking that Putin’s speech is not quite as negative as some are making it out to be. It was interesting, for instance, that he referred again to Western states as Russia’s ‘partners’, and that he categorically rejected the idea that Russia was turning its back on Europe in favour of Asia. ‘This is absolutely not the case’, Putin said. Furthermore, Putin ended his speech with an appeal to Russia and the West to work together to solve global problems, and argued that this could be done through existing institutions such as the United Nations, which, he said, was ‘irreplaceable’. This then was not a call for a new Cold War. It was some way removed from speeches and articles by many in the West which have called for ‘containment’ of Russia or some other similar policy which clearly casts Russia as an enemy. 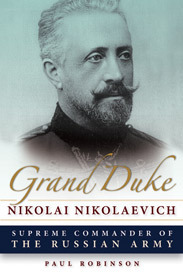 However intemperate Putin’s language occasionally was it was not as hostile as a lot of that being used by Western politicians against him. It is clear that Putin is not seeking to make relations between Russia and the West even worse than they are. This, sadly, is not something which can be said about some in the West. Is Canadian foreign policy making the country any safer? I have a piece about the shootings in Ottawa in the online version of The Spectator, which you can read here. This week in our class ‘Russia and the West’, we are examining the Cold War. From the West’s point of view, the Cold War was the fault of the evil, aggressive Soviets. The Soviets, of course, saw it rather differently. 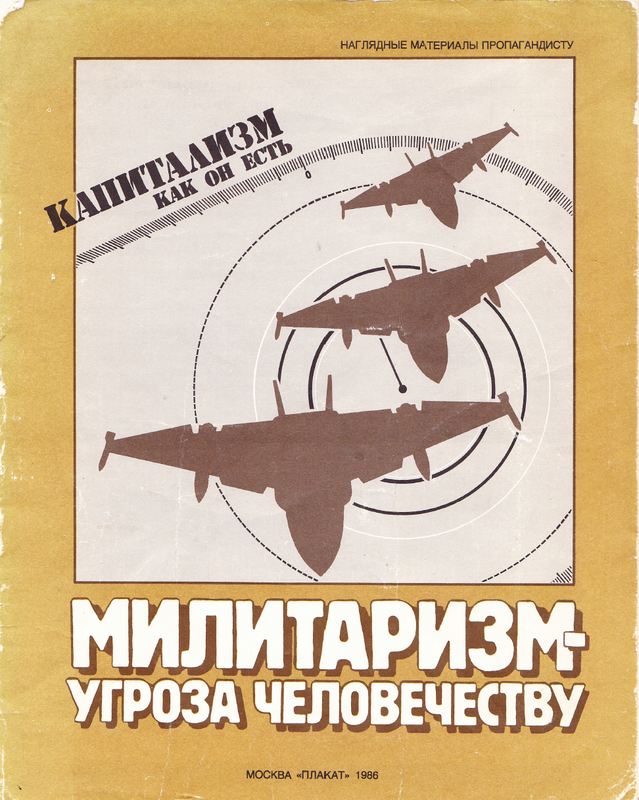 To give something of the Soviet perspective, I offer you this little pamphlet I bought in Minsk in 1987 while studying at the Minsk Institute of Foreign Languages. At the time, I regarded it as propagandistic nonsense. I don’t have much sympathy with this class-based socialist analysis of the roots of militarism, but the view that capitalist states use their military power for ‘aggressive external political objectives’ is one I can agree with these days. Similarly, the criticism that the military-industrial complex serves the interests of narrow groups within society at the expense of society as a whole is one that rings true. 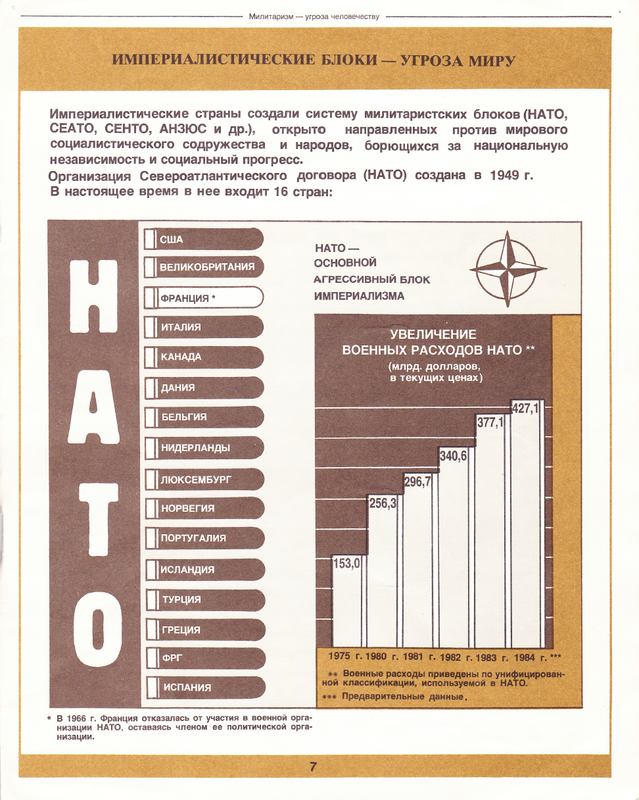 On page 7, the pamphlet outlines the growth of the military expenditure of the ‘imperialistic bloc’ NATO, whose policies are ‘directed against the peaceful socialist communities and peoples, who are fighting for national independence and social progress’. The graph shows that between 1975 and 1984, NATO’s annual military expenditure rose from $153 billion to $427.1 billion. 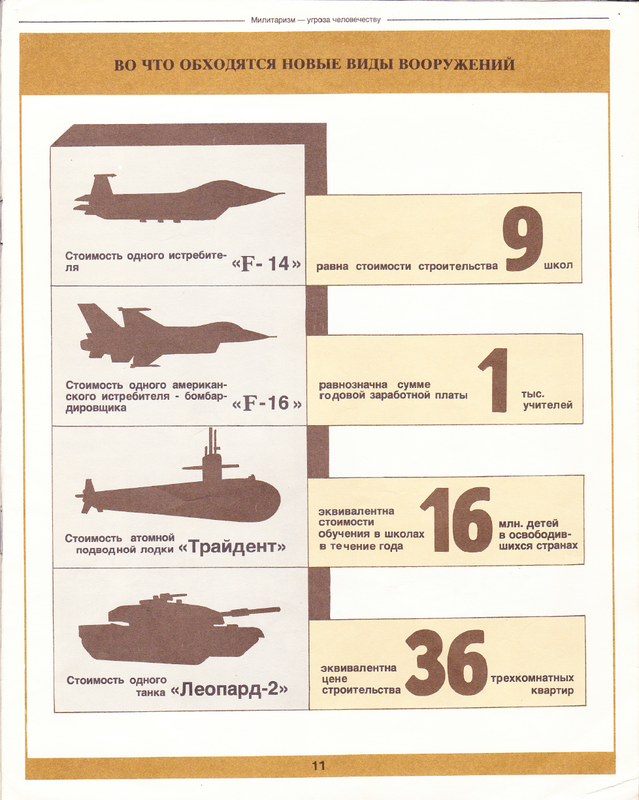 Of course, the pamphlet does not mention what the Soviet Union was spending on defence. Had it done so, it would have had to admit that the Soviet Union was every bit as militaristic, if not more so, than the West. Militarism is not a product solely of capitalism. Still, while the Soviets were hypocritical, their criticisms of the West were not completely unjustified. Although we think that our military spending and actions are defensive, they don’t always look that way to other people. This morning a report landed in my email inbox from the American Special Inspector General for Afghanistan Reconstruction (SIGAR) entitled Poppy Cultivation in Afghanistan. 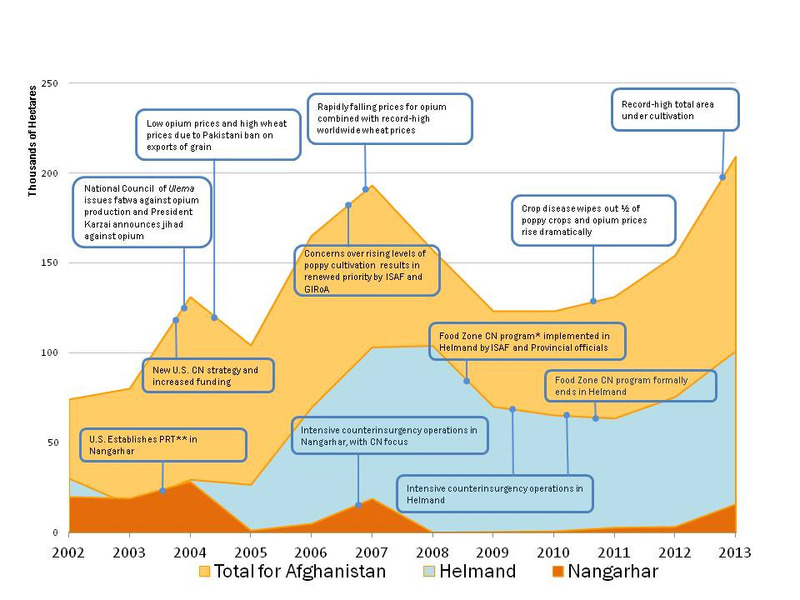 SIGAR audits the development assistance provided by the United States to Afghanistan. His reports make depressing reading, being mostly a catalogue of billions of dollars of misspent resources producing few if any positive results. Attempting to prevent people from consuming illicit drugs by destroying the supply is a strategy that has not had notable success anywhere else. Yet, as with so many other failed policies America and its NATO alllies insanely persist in doing the same thing over and over again in the hope of getting a different result. How can this be explained? Psychology provides a clue in the form of the ‘Fundamental Attribution Error’: people attribute others’ mistakes to something internal to them (e.g. their malice or incompetence), but their own mistakes to some external factor beyond their control. So it is that in this case, the US Department of State and the Department of Defense, in their responses to SIGAR (included in the report) lay the blame for the bad poppy cultivation figures on the Afghan government. ‘Our counternarcotics goals can only be accomplished when these are also Afghan counternarcotics goals’, says the Department of State. ‘In our opinion, the failure to reduce poppy cultivation and increase eradication is due to the lack of Afghan government support for the effort’, says the Department of Defense. This, of course, is an entirely self-serving explanation, as it excuses the Americans for their own failures. It thereby allows them to persist in the belief that counter-narcotics strategies are not inherently futile, and to continue to pour resources into them in the hope that next time things will work out right. A provocative piece by Vera Graziadei, though I should point out that, as reported by Amnesty International, crimes have been committed by both sides. Update: Amnesty International has issued a report today (20 October) concluding that evidence ‘points strongly to the commission of at least some extra-judicial killings by both sides in the conflict.’ I may return to this in a later post.